Battlefield 3-Pocket Military Shorts BT3P - C/O. 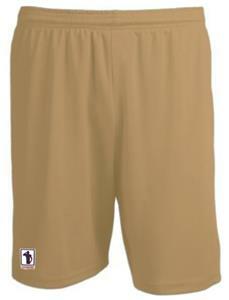 This short is made of 100% polyester with moisture management fibers. It features "deep" side pockets and one buttoned back pocket. Other features include a 2" extra comfortable covered elastic waistband with inside drawcord and inside lined. This short is made of 100% polyester with moisture management fibers. It features "deep" side pockets and one buttoned back pocket. Other features include a 2" extra comfortable covered elastic waistband with inside drawcord and inside lined. Bottom right leg has saluting authentic military logo. WAIST 26.5" 28.5" 31.5" 33.5" 35.5"
Inseam: Inseam on Adult Medium: 9"
Made very well. Waist was a large but the rest was made like an extra large. Awesome quality, will buy more of this brand.